The Great Lakes region is sending the year out with a bang. Wave after wave of lake effect snow has pummeled the region, making for a record-setting white Christmas and a shoveling project that could take until New Year’s Eve to complete. Erie, PA, is under a snow emergency after 53 inches of snow fell in 30 hours—the state record for the snowiest two-day period. It’s also more than Chicago, Boston, Minneapolis and a slew of other seemingly snow cities get over an average winter. The crazy snow totals don’t stop there. In Redfield, NY, more than 32 inches fell in 24 hours between Christmas Day and early Tuesday. The region is expecting up to an additional 36 inches of snow by tomorrow, making shoveling a futile task. If Erie picks up four inches, it will officially set the record for the snowiest December ever recorded in Pennsylvania. The region from Cleveland to far upstate New York is no stranger to massive snow totals. Its geography sets it up perfectly for these types of large snowstorms. And in a seemingly strange twist of fate, climate change could actually provide them with a boost. Lake effect snow requires a few things to fall into place. The first, as with all snowstorms, is cold. It’s gotta be below 32°F to snow. For the Great Lakes region, cold air dropping out of Canada provides that key ingredient. But what allows lake effect snowstorms to produce such huge amounts of snow is, well, the lakes. Specifically, it’s the difference between the air temperature and the water temperature of the Great Lakes. As cold air rushes over lakes, it sweeps up some of the heat (relatively speaking) and moisture from the lakes’ surface. The length of the Great Lakes allow these burgeoning storms to pick up a huge head of steam as they barrel toward land. By the time they reach the Great Lakes’ shores, the air has become so moist and unstable that it unleashes a massive amount of snow with rates that can approach three inches an hour. The shape of the lakes and direction winds usually travel means that within the region, there are lake effect snow hot spots. The areas around Buffalo and Syracuse can get particularly snowy because winds are able to travel over long expanses of Lake Erie and Lake Ontario, respectively. Parts of Michigan are also prone to heavy lake effect snow, particularly areas along the south shore of Lake Superior. The snowiest ski resort in the Midwest, for example, is on the Keweenaw Peninsula, which juts out into the lake from the Upper Peninsula and acts as a lake effect snow magnet. Lake effect snow is most common in November and December when there’s a lot of open water on the Great Lakes. As winter wears on and the lakes freeze over, moisture for these storms disappear. Ice only covers 3 percent of the Great Lakes as of Saturday but a coming Arctic blast could cause them to rapidly freeze up in the coming weeks, shutting down lake effect snow season. That’s where climate change comes in, though. Peak Great Lakes ice cover has been declining since satellite measurements began in the 1970s. Less ice means more chances for lake effect snow. And turns out that that’s exactly what scientists have observed. A 2003 study looking back to the 1930s showed an increase in lake effect snow across the entire lake effect snow region. A 2009 study using slightly stricter quality controls found that areas downwind of Lake Superior and Lake Michigan have seen significant increases with slightly less significant increases near Lakes Ontario and Erie. But snow could become less bountiful if climate change continues to wreak havoc. Warmer weather means less ice on the lakes, but it also means fewer days with freezing weather. 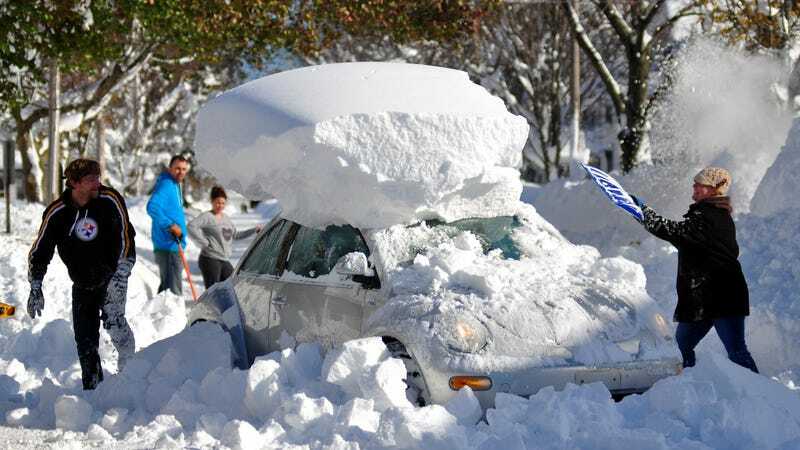 Without early season cold, early season lake effect snowstorms could become less common according to a 2015 study. Ditto for late season ones after the ice starts to break up. That’s bad news for snow lovers, but a small silver lining of climate change for future 20somethings stuck at home for the holidays (lol kidding, their lives will probably be hell).